Our Crowd Calendar predicted crowd levels of 8 at the Magic Kingdom during the week including Thanksgiving. Thanks to our crack research squad and our trusty users of our mobile application Lines we are now able to look back and see how we did. Historically, based on our current model, our estimates are accurate within 8 minutes, 95% of the time. We see on the chart from November 21 – November 28 that the estimates were pretty close with a couple of exceptions. Crowds in general were heavier than we predicted. This was partly due to the re-opening of Space Mountain. Space Mountain re-opened on November 24th but did so with a sporadic schedule. When an attraction closes down many times during the day, the wait times tend to spike each time the attraction comes back online. 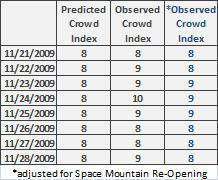 The third column shows an adjustment for the spikes observed at Space Mountain. Even with the adjustment our estimates were too low. We often get asked about what the crowd level index means in terms of crowd experience. “What does an 8 feel like?” If you were in the parks during Thanksgiving week, let us know how the size of the crowd affected your park experience. Was the Crowd Calendar helpful? How do you use the Crowd Calendar? What information would make the Crowd Calendar better? Our Crowd Calendar is always adjusting to the data we observe and we realize that like any predictive model it is subject to error. Still, we’re always curious how our readers use the calendar when planning their trips. In the parks and want to know what’s going on? Try out Lines, current and future wait time estimates for every WDW attraction. Hi Guys, I use the crowd calendar to plan visits, make touring plans, and predict how to pace ourselves and adjust our expectation levels in the parks. Something that would be more helpful to me would be to distinguish the crowd levels at the four parks if there is anyway possible to do this. For example, say there is a crowd level prediction of 8 for the day & the recommended park is AK and the don’t go is EP. I would like to be able to judge what the crowd level should be if we decided to go to AK, DS, or MK. If we are making a short trip, sometimes we need to visit a park that isn’t recommended for the day but we aren’t sure what crowd level to expect at that park. I’ve been assuming that when I see a crowd level prediction that it’s probably for the don’t go park(s) and probably better at the others. This would be very helpful information to plan whether or not to go on holiday breaks/busy times. By the way, usually the MK will be fairly quiet the day of hard-ticketed party events although the crowd predictor usually says don’t go to MK on these days. It might actually not be a bad idea to go on these days (if not being in the park for the fireworks show is not important) because you can just about do everything you want on days like this. I know it’s hard to swallow using a ticket for a short day, but I think it’s worth considering when you can get to everything you want to within the shorter day & not have to deal with high crowds. I have a similar question as the previous poster. I understand that the crowd level is for the MK. Looking at my trip at the end of January/beginning of February, I am wondering about the following: On January 31 MK is the worst park, while on February 1 it is recommended. But the crowd level on February 1 is higher than on January 31. Wouldn’t it be better to go to the MK on the days with the lowest crowd level predicted if those are the predicitons for the MK? Oh and I wanted to say that I am very impressed with the accuracy of your predictions! I really love it that you have such a scientific method behind all your recommendations. We visited MK on the 23rd and the 25th. Our experience on the 23rd I could easily believe it was an 8 – it was quite conjested, although honestly the waits weren’t bad. However I think you are way off on the 25th. It rained all morning and the park was EMPTY all day. There were virtually no lines on any of the rides (I think the only thing we waited more than 15 minutes on without fast passes was Peter Pan) and the difference in just general congestion from the 23rd was very stark. I’m not too sure how the crowd calendar could predict rain. I think to make a best guess and be off by a few minutes on headliners provides me with enough information for my trips. We were in the parks from 22-28 November, with the exception of Wednesday 25 Nov, when it rained buckets (and we had planned a day at Downtown Disney, anyway). We found the crowd calendar to be very helpful, especially the late increase in the projected crowd levels. It helped us expect the larger crowds and plan for them by going with the best/worst day recommendations and just internally set our expectations. We knew it was going to be busy and we should be prepared for that. We were in MK on Monday 23 Nov and Friday 27 Nov and did the 2-day plan for adults. Monday we did the part of the plan that started in Tomorrowland and it felt jam-packed crowded all day long. Friday we started in Frontierland and it had a completely different feel–very, very light well into the late morning. Probably had something to do with the temperatures being in the 40s to start the day and people weren’t too excited about doing a water attraction like Splash or an attraction where you get a lot of wind in your bace like Big Thunder Mountain Railroad. But I also think that Space Mountain is going to skew crowds for the Tomorrowland side of the park, especially if it continues to go down for significant portions of the day. Speaking of skewing crowds–wow, Toy Story at the Studios and (to a lesser degree) Soarin at Epcot really create huge waits, even waits for FP. I know the crowd level projections are for MK and the other parks are rough estimates, but it would be great if we could get more precise crowd levels for the other 3 parks, too. We were at WDW on Nov 23 (evening) through Nov 27. If that was an 8 or 9, I don’t want to see a 10. Every park was packed, especially Thursday and Friday. We love WDW and will definitely go back in a couple of years, but never again at the holidays! Echoing some of the thoughts earlier, I have to agree that individualized crowd calendars would be the most significant improvement imaginable, although I’m guessing this is far from a trivial task. But the benefits would be huge, as it would allow for an apples to apples comparison that really isn’t possible under the current structure. For example, as mentioned, it’s tough under the current system to determine whether it’s better to visit Park X on a day when it is the best park during a 7 crowd or a park to avoid with a 4 crowd. Similarly, I imagine there are also “degrees of avoidance” as well. For example, we were thinking of going to DHS one day this past weekend. It was a park to avoid both days (as it is pretty much every weekend). However, even if both days had the same crowd index (they didn’t), I doubt crowds would be comparable both days. The reason? Saturday had morning EMH and no Fantasmic; Sunday had evening EMH and two Fantasmics. Of course, when you do add in the fact that Saturday was an 8 and Sunday was a 4, there really is no point of reference for interpreting which day would have been better. Being able to directly compare days for a park would be awesome. We predicted an index of 6 (wait times of 55 to 64 minutes) for November 30, and the actual peak was 70 minutes (Space Mountain, 3:06 pm). So we were off by 6 minutes, or 1 on the scale. We predicted a peak of 4 on November 29 and the actual peak was 8 (Space Mountain again). That’s a difference of 4 on the scale. This is almost certainly due to Space Mountain shutting down at 3 pm for a mechanical failure. To that point waits were in the 40-minute range. The peak waits for Splash and Big Thunder were both 45 minutes for the entire day. Each time I have chosen to use the Crowd Calendar as a guide for my trip I have not been disappointed. That includes following the advice regarding which park(s) to avoid. I respect the fact the Crowd Calendar is a guideline and that I am responsible for my decision-making and my enjoyment. As is stated elsewhere on this site, having a good touring plan more than makes up for any level crowd at WDW. Even though I tend to visit at the busiest times I have always managed to see and do what I want to. Of course, that means I do not expect to do ‘everything’ in one day, and I travel alone or in a small group…so I do not have the issues larger families deal with. Still, I find being wedged into the Magic Kingdom to enjoy the fireworks on July 4th to be far better than having all the sapace I need on my balcony to see local fireworks over the treetops. But that’s just me. I’m grateful for the tons of work these folks put into the Crowd Calendar and the book/website. Very useful tools for visiting WDW! Adding to the confussion…I have two choice for going to the Studios (I want ot take my kids on Toy Story Mania), December 18th, 4 on the crowd index and December 22nd, 7 on the crowd index. It’s recommended on the 22nd and a park to avoid on the 18th. With a 3 point differnce in the crowd index, what should I do? My advice would be to arrive b/4 the park opens, and walk to the Fastpass line for Toy Story Mania to get your Fastpasses. Then get in the standby line to ride the ride. After you ride it the first time, you will be able to ride it again with your Fastpass. I think either the 18th or the 22nd would be good choices to visit DSH; however, the 21st has Extra Magic Hours at night so people that visited that park at night probably wouldn’t be coming back first thing the next morning. On the other hand, the week b/4 Christmas (Dec. 18th) may be less busy than Christmas week. I’m not sure why the touring plan would list it as a park to avoid on the 18th. Toy Story Mania is a great ride and I can see why it attracts such large crowds. The upside concerning the crowds, is it takes pressure off of many of the other attractions at that park. We were in the MK on Nov. 22 (Sunday) and Nov. 23 (Monday). We arrived when the park opened and didn’t have too many problems with the crowds until after lunch. Sunday afternoon was packed (felt like a 9 or 10 to me), but we followed the two-day touring plans and were pretty much done with our plan by the time the crowds were too bad. Monday afternoon was busy also, but not as bad. Monday morning was great. We went straight to Splash Mountain and walked right on, then walked right on to Big Thunder Mountain Railroad. We did BTMR again without a wait and went back to Splash Mountain and had a very short wait. Then we got on Pirates with only about a 5 minute wait. By then, we noticed the crowd was growing. I’ve used the Crowd Calendar to schedule and plan 7 trips, 6 done and 1 in a couple of weeks. I have found that as is, they help me choose which week we will visit the world. That said, I haven’t always opted for the lowest numbers, instead, I’m prepared to get to the parks early and have a plan when it is most critical. I also take the parks to avoid under advisement when scheduling which parks on what days. The information I am most desperate for is, crowd calendar information that is more specific to EP and DS. Let’s face it, while I really feel bad if I miss Pirates or Splash Mtn. on a trip, it is not nearly the bummer of missing Soarin’ or Toy Story. We went to Disney World Nov 20-Nov 27. We went to a different park each day, and each day was very crowded except for Wed 11/25 – – once it started raining, everyone left and we practically had the place to ourselves. They let us stay on rides without having to get off at all! We had a blast that day. I highly reccommend not leaving if it starts to rain! Just put your poncho on and you’ll have a great time! Just a head’s up for December. I’ll be down there 12/6 -12/12. The crowd calendar has those days as being very lightly crowded. We tried to get an additional room for sister and ALL the resorts by the Magic Kingdom are sold out. Polynesian, Contemporary, Floridan, etc. Every room. I am guessing that the crowds will be much heavier than predicted. Will let you know for sure when I am there. Believe me, I’m hoping you’re right and I’m wrong! Actually, this is something we see often in December. Events like Pop Warner will take up a lot of Disney’s Hotel Rooms but the increase in crowds at the parks is marginal at best. The crowds will be completely manageable. In fact, surprisingly, hotel occupancy is not a good predictor of crowds. Disney’s hotels are almost always at a high occupancy rate. I just returned from a week at the World, I have been there at this time of the year many many times and have never seen crowds this heavy. Waits for Toy Story exceeded 70 minutes, fast passes for soaring were gone first thing. It was not summer busy but still pretty crowded. I wonder if the free dining had anything to do with the crowd level? We will be in Orlando the Martin Luther King weekend, what day would be the best to visit WDW. We will be spending one day in the Magic Kingdom with a 2 year old and 14 year old. I thought about Sunday because there is extra magic hours for hotel guests on Saturday…..would love any suggestions. We are arriving Thurs and leaving Tues, so we can go to MK on Sat, Sun or Monday. I visited the four parks from Nov 21st to 26th and did not have a problem with anything, but I expected the worst when reading this site about Thanksgiving week. Most importantly my children had the best time and never once did waiting in line became a drain on the kids. My children range in age, 10, 5, and 3. There are two main things that I did to enjoy the parks: get there before the gates open and have an itinerary made out for each day. I did not try to go on every ride…many of them can be easily bypassed (i.e. Dumbo ride, merry-go-round –have plenty of those types of rides at other amusement parks). Similar experience on the other days. Monday was Hollywood Studios (Rollercoaster (walk on), Tower of Terror 15 minutes, get fast pass at Toy Story Mania (return at 3:15), Playhouse Disney 10 minutes, Ant playground, Star Tours (15 minutes (I can see why)), Pizza Lunch, Indiana Jones, watched HS Musical event out by the hat. 3pm party, Toy Story Mania (120 minutes for non-fast pass people…glad I got mine), Beauty Beast show (3/4 full), Walt Disney Museum, more character greetings, Dinner, Osbourne Lights, go back to resort and swim in pool. Tues was Epcot EMH – Test Track first ones on, Mission Space wimpy version (walked right up – spent more time listening to the briefing than riding the ride, fast pass for Sorin’ 10:15-11:15?, waited for Innoventions to open up a 9am to ride Sum of all Thrills (walked right on), played with the Waste Management game and other fun stuff. Got on Soarin (120 minute w/o fast pass about 20 minutes with fast pass), Festival of Lion King no wait there. Jumped over to MK for lunch with the Cinderella in her castle. Jumped back to EPCOT and spent time World Hopping catching each band from each country, grabbing a country specific beer from some. This was the parent’s time to have fun. Met tons of characters (Mary Poppins, Alice in Wonderland, Beauty Beast, some kind of cat). Ate quick service at Morocco (stormed while eating inside– lucky). Went to America saw their show. Played drums somewhere between countries and got a nice spot to watch the fireworks at Norway. Wednesday was Animal Kingdom (dreary day). We were selected to open the park. That was cool. Got free photos, a fast pass to use anywhere, and got to stand on the other side of the turnstiles and shake musical instruments to open the park. It rained most of the morning and on and off drizzle for the afternoon. With ponchos no problem. Rain sure flushes out alot of people. No lines for any of the rides. Got to see all the stage events. I had this fast pass and did not know when to use it. Rode Expedition Everest 2 twice — one after lunch and one after dinner. Ended up using the FP for Expedition Everest after dinner because at that time the line was about 20 minutes without a FP. So in 5 minutes we were on. Last ride was Primevil whirl practically a walk on. Our flight left late on Thursday. We could have gone back to the park for most of the day, but since we did everything on our itinerary, it wasn’t worth going back to do the one or two rides that was on our alternative rides list. So we end up spending the day at Downtown Disney (boring, at least for me, the wife spent 160 on Disney Xmas stuff) Though there is good food and snacks for the return trip home that are part of the Disney Dining Plan. In summary, I would like to thank Disney for all the free meals and a great time. I guess what I would take away from the experience is to have expectations BEFORE your arrive as to what you really want to do. Reading many web sites like these that talked about the worst crowd weeks helped put the fear of god in me that the week I choose would be difficult to enjoy. This helped me in planning my week. When I got there and found out that it wasn’t really bad, the expectations were met and that made the days extra fun. What is going on at Disney on December 16 to shoot the crowd level up to an 8????? I just returned from a long weekend trip to attend MVMCP at MK on 12/06/09 and to go to DS to see the Osbourne Lights on 12/07/09. I suggest that you add the filming days for Disney’s Christmas Parade and other Christmas Day events to the notes in the crowd calendar and adjust the crowd level appropriately. When we arrived at the MVMCP at 4:00, the park was quite full due to the extra 5,000 people Disney let in to act as the crowd for the Jonas Brothers filming. At the time of arrival, Space Mtn was a 70 minute wait making the crowd level closer to a 7 then a 4 as predicted by the crowd calendar. I bet they are filming or something of the likes on Wed the 16th. But… it is supposed to rain, so may be no issue after all. OK Fred, so here’s a question. Starting to plan a trip for next December. (Never too early to start, right?) I see that December 25 – December 31, 2009 are all 10s. No surprise there. Scanning through the rest of the calendar, there is only one other day for the next year that is listed as a 10. This is December 4, 2010. While I’m aware that it is a Saturday, and it is nestled between MVMCP dates, it is still just December 4. There are no 10s around Easter, no 10s around July 4. Just out of curiosity, what gives? Filming for the Christmas Parade. The above reply was for Jay on why December 4 was a 10. I agree with some of the above that a great addition would be seperate crowd calendars for each park (hey, as long as it’s someone else is doing all the work). The only other possible suggestion I can think of is that the current scale goes from 1-10 but have 1,2 and 3 ever been used? Perhaps re-assigning the numbers to a slightly smaller range so that the lowest that ever appears now (4) will become a 1. It would help to illustrate smaller but still measurable differences in crowd levels. Our last trip was in mid-May, all 6’s and 7’s but thanks to the calendar and touring plans we quite literally walked onto about 75% of all attractions throughout our vacation and never waited more than 10 minutes (Spaceship Earth) for anything other than Fantasmic. We walked onto both Space Mountain (before it closed) and Sourin’ twice then returned a third time with a fastpass. It’s a fantastic resource, many kudos.